You can't keep an old hoofer down, and really, why would you want to? Northwest Senior Theatre performers have been entertaining audiences for more than two dozen years, led by King City resident Ray Beyer, who came on board as the artistic director in 2004, only the third director since the company was founded in 1991. 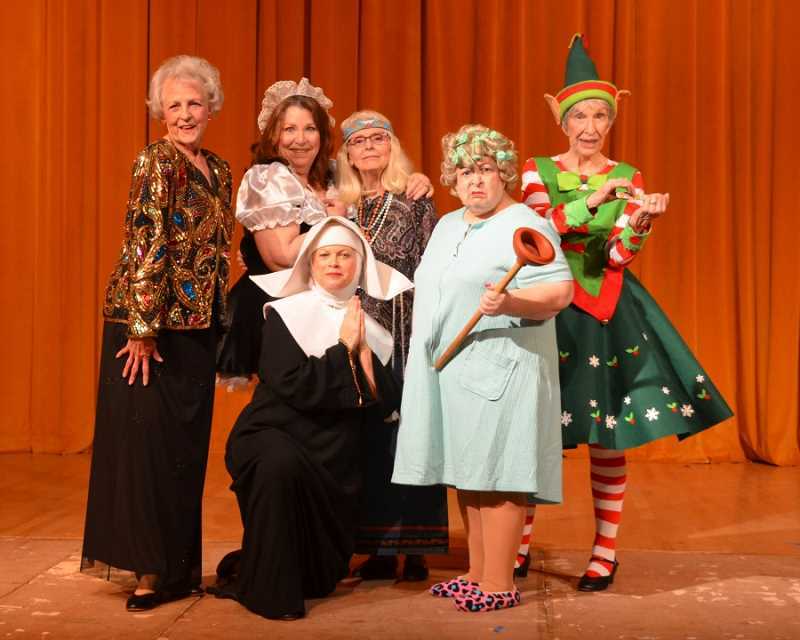 Thousands of loyal audience members who enjoy the semi-annual musical revues put on by Northwest Senior Theatre eagerly await each show, and now they won't have to wait much longer for its 2017 holiday show, "It's Christmas Time," that runs Nov. 15 to 18. On Oct. 10 the cast gathered at the Alpenrose Dairy Opera House, where performances are held, to don costumes for a photo shoot for the holiday show, and several of them took a few minutes to chat about their love for performing and why they can't stay away from the stage. Myrl Svela started with NST 19 years ago after previously singing with the Sweet Adelines. "I had a friend who invited me to come try NST," she said. "I thought it sounded interesting, so I decided to see what it was about. I could tap dance, and I was an acrobatic dancer when I was very young and also attended the Cornish College of the Arts in Seattle. Then I met my husband and had children, and we got transferred around a lot. "In Los Angeles I performed at a dinner theater for two-and-a-half years and was portable so I took the show on the road," she added. "I don't know when I will do my swan song, but I'm thinking maybe it will be when I'm 90 at the 20-year mark." NST even has a "'show-mance" due to Gerry and Ralph Cox getting married seven years ago after they both joined the troupe 11 years ago. "I take voice lessons, and my teacher had been after me to do this show," Gerry Cox said. "I went the next Tuesday, but I never thought I could do this. I sang my first solo at age 13 and the next one at age 52. When I auditioned, I thought it would just be for the director, not the whole cast, but they were so supportive and friendly and applauded after I sang." Ralph Cox, who had seen a NST show and auditioned just two weeks before his future wife, said, "They looked like they were having so much fun when I came." Gerry Cox had always been a soloist but right away was asked to do harmony with Ralph Cox for her first show. "When we walked out hand in hand to sing during a performance, my granddaughter was in the audience and said, 'G-ma has a husband,'" she said. "But we were friends at first. "I have always loved to sing, and I love to sing a lot of Broadway tunes. There's no place else we can sing these songs. Ralph is a wonderful singer and joined the Tigard Pops. After we got married, we were the only married couple in the show for a long time. Now another married couple has joined too." Ralph Cox added, "I love this music, especially from the '30s and '40s. I feel sorry for the rappers today. What will their music be?" Leland Wallace has been with NST more than 14 years and joined by accident, literally. A friend he sang with for several years ended up with his leg in a cast and asked Wallace to come and fill in for him. "The first show I only sang one solo, and I've only missed one show since I started," he said. "I started singing at age 2, and I just keep coming back." MaryAnn Rautio had previous singing experience, including in a quartet and in a chorus in Oregon City. "I have to sing," she said. "If you sing, you perform. I can express myself. You have to learn how to sell a song. I have to have something to do that is fun and creative. I like singing in the chorus too, and I know every line in every song." Betty Merrill, who also does publicity for the shows, joined in 2003 and said singing in the shows keeps the cast members vibrant and alive. "One of our members said that men who have worked all their lives and retire and go sit in a chair will die soon after," she said.